High on the top of Huntingdon Hill sits a Bronze Age cairn called Huntingdon Barrow and apart from the views it affords there is apparently nothing exceptional about it. That is until you see it’s local name – the ‘Heap o’ Sinners‘ which conjures up all sorts of images and questions. Firstly the cairn itself, when it was surveyed in 1977 the recorded measurements were that it had a diameter of 22 metres and a height of 1.7 metres. In 1995 it was survey again and was found to have lost 0.3 metres in height. The main cause of this shrinkage was due to its stones being taken to embellish a walker’s cairn along with two makeshift shelters. However, alterations to the cairn had been occurring some twenty odd years previous to 1977 thanks to the handiwork of one Frederick Symes AKA MooRoaMan. Symes was a character who squatted in the nearby empty Huntingdon Warren farmhouse which he called ‘The Lonestead’. Look in Eric Hemery’s ‘High Dartmoor’ book and we learn of old Fredrick Symes that; “His roaming took him spasmodically to Huntingdon Barrow where his practice in cairn-building surpassed the most ambitious efforts of casual visitors; thus the sensational cone, now much blunted, that pointed skywards here in the 1950s, when MooRoaMan used to gleefully refer to its grotesqueness as appropriate to ‘the Heap o’ Sinners.’, p.312. Now the thing that fascinates me is how on earth did a cairn get the name of ‘Heap o’ Sinners‘? If you look in the works of the early topographers such as J. Ll. W. Page and Samuel Rowe there is no mention of the cairn. Therefore it could be that the name ‘Heap o’ Sinners‘ was not in circulation in the late 1800s. However, this does not necessarily mean it wasn’t so called it could be that they didn’t consider the monument important enough to write about. 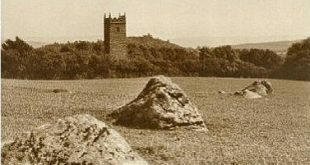 As far as I can find the earliest topographical book to record the name is William Crossing’s ‘Guide to Dartmoor’ which was first published in 1909. On the Ordnance Survey map of 1809 neither Huntingdon Barrow or the ‘Heap o’ Sinners‘ is located and on the 1945 map the cairn appears as a tumulus with no name. On the 1967 map the tumulus label has changed to cairn but still with no name. If you look at English Heritage’s Pastscape record it says that the name ‘Heap o’ Sinners‘ had been confirmed in 1977, sadly it does not say how? So basically the available maps I have and those accessible on the internet are not a lot of use in solving this puzzle. Having looked at numerous photographs of the cairn taken from all angles I simply cannot see a way that its shape could resemble anything that looks like piles of people/bodies. So I would say that the name did not come about from any similarity to such a thing. Moving into the realms of pure speculation, could it be a case of somebody misinterpreting the local dialect on some document that has then been repeated so as to actually replace the original words? If this was the case then literally 50 metres north of the cairn is an area of old tin workings consisting of a gert and test pits. Could it be that originally the cairn was known as the ‘Heap o’ (of the) Tinners‘ and has become muted due to mis-hearing to the ‘Heap o’ Sinners‘? Whilst doing a Google search for the ‘Heap o’ Sinners’ I came across plenty of photographs but no mention of the place-name’s origin. What I was directed to was the call-out log of the Ashburton Dartmoor Search and Rescue Team. On the 24th of January 2014 the Ashburton Dartmoor Search and Rescue Team were called out to search for a missing woman at 18.25. Naturally the search took place in darkness but fortunately the woman was located at the ‘Heap o’ Sinners‘. She was wet and cold and found to have no map, compass or torch in her possession. Here is a prime example of the stupidity of people who go out into the moor with no knowledge of navigation or any means of using a map and compass. Had this person at least had a map they could have easily seen two options for getting to safety; either go to the old warren farm and pick up the track back to Lud Gate and habitation. Or simply follow the Western Wellabrook to its confluence with the Avon and then follow the Avon down to the dam and back to Shipley Bridge – Amen. Finally should anyone know the true origins of the ‘Heap o’ Sinners‘ place name then please let me know so I can sleep at nights without puzzling as to the possibilities.